The Pony Express was founded by William H. Russell, William B. Waddell, and Alexander Majors. Plans for the Pony Express were spurred by the threat of the Civil War and the need for faster communication with the West. 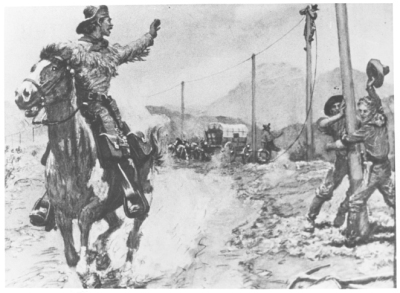 The Pony Express consisted of relays of men riding horses carrying saddlebags of mail across a 2000-mile trail. The service opened officially on April 3, 1860, when riders left simultaneously from St. Joseph, Missouri, and Sacramento, California. The first westbound trip was made in 9 days and 23 hours and the eastbound journey in 11 days and 12 hours. The pony riders covered 250 miles in a 24-hour day. Eventually, the Pony Express had more than 100 stations, 80 riders, and between 400 and 500 horses. The express route was extremely hazardous, but only one mail delivery was ever lost. The service lasted only 19 months until October 24, 1861 when the completion of the Pacific Telegraph line ended the need for its existence. Although California relied upon news from the Pony Express during the early days of the Civil War, the horse line was never a financial success, leading its founders to bankruptcy. 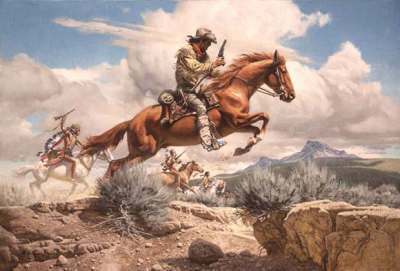 However, the romantic drama surrounding the Pony Express has made it a part of the legend of the American West. More than 1,800 miles in 10 days! From St. Joseph, Missouri, to Sacramento, California the Pony Express could deliver a letter faster than ever before. In operation for only 18 months between April 1860 and October 1861, the Pony Express nevertheless has become synonymous with the Old West. In the era before electronic communication, the Pony Express was the thread that tied East to West. As a result of the 1849 Gold Rush, the 1847 Mormon exodus to Utah and the thousands who moved west on the Oregon Trail starting in the 1840s, the need for a fast mail service beyond the Rocky Mountains became obvious. This need was partially filled by outfits such as the Butterfield Overland Mail Service starting in 1857 and private carriers in following years. But when Postmaster General Joseph Holt scaled back overland mail service to California and the central region of the country in 1858, an even greater need for mail arose. The creation of the Leavenworth & Pike's Peak Express Company by William H. Russell, Alexander Majors, and William B. Waddell became the answer. It was later known as the Pony Express. On June 16, 1860, about ten weeks after the Pony Express began operations, Congress authorized the a bill instructing the Secretary of the Treasury to subsidize the building of a transcontinental telegraph line to connect the Missouri River and the Pacific Coast. The passage of the bill resulted in the incorporation of the Overland Telegraph Company of California and the Pacific Telegraph Company of Nebraska. While the lines were under construction, the Pony Express operated as usual. Letters and newspapers were carried the entire length of the line from St. Joseph to Sacramento, but telegrams were carried only between the rapidly advancing wire ends. On October 26, 1861, San Francisco was in direct contact with New York City. On that day, the Pony Express was officially terminated, but it was not until November that the last letters completed their journey over the route. Most of the original trail has been obliterated either by time or human activities. Along many segments, the trail's actual route and exact length are matters of conjecture. In the western states, the majority of the trail has been converted, over the years, to double dirt track roads. Short pristine segments, believed to be traces of the original trail, can be seen only in Utah and California. However, approximately 120 historic sites may eventually be available to the public, including 50 existing Pony Express stations or station ruins. 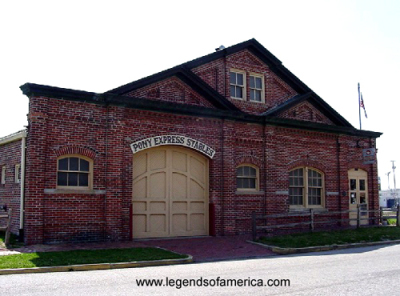 During the 1950s, a portion of the neglected Pikes Peak Stables in St. Joseph was saved from total extinction and became the Pony Express Museum. M. Karl Goetz and the Goetz Pony Express Foundation, along with aid and support from the Chamber of Commerce, the citizens of St. Joseph, and the St. Joseph Museum, Inc. helped to save this historic structure. After stabilization and renovation of the remaining portion, new exhibits were installed, and the stables opened to the public. In 1993, the museum underwent a further renovation to restore the remaining portion of the stables to its original size. Modern, interactive and educational exhibits were created to depict the need, creation, operation and termination of the famous mail service that lasted from April 1860 to October 1861. Today the museum continues to stand as a tribute to the legend and legacy of the Pony Express and its enduring era.